Despite the excellence of the BBQ Cuban Sandwiches, the time constraints and grill space of a one day BBQ competition cause me to lean against an all day pork shoulder smoke and towards something less labor-intensive and time-consuming. Fish sandwiches were a hit the last time we tried them, and the total cook time is relatively low. For these sandwiches, I am going to improve on my prior errors. 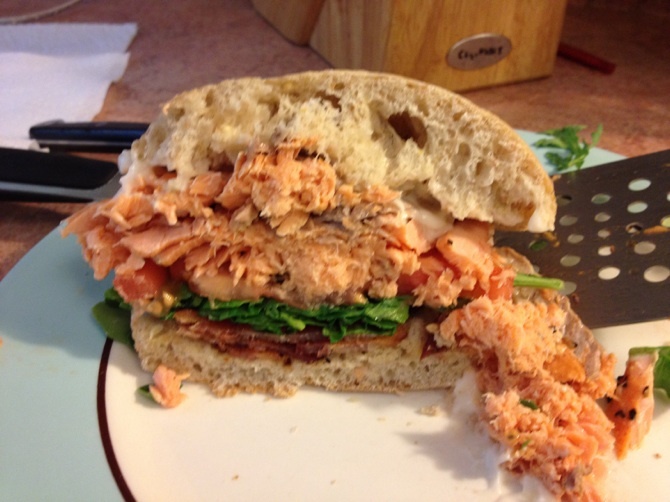 The walleye and char were both fairly thin fish filets and I want a lot of meat on the sandwiches. 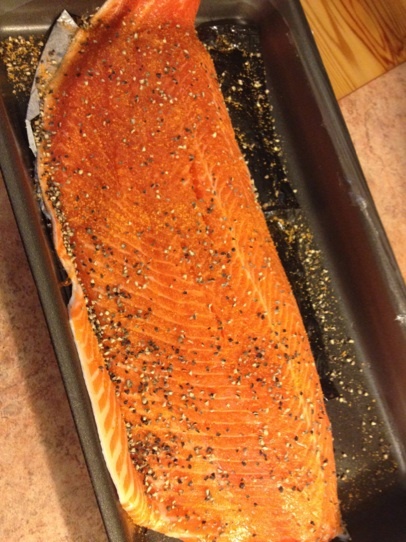 What do I find waiting for me at Sam’s Club but this huge, beautiful filet of Steelhead Trout? For pre-BBQ seasoning, I just put on some Lawry’s salt and coarse black pepper. Simple, easy. I made a few slices in the skin and rested the filet on a wood soaked cedar plank, with the skin side up over semi-direct heat. The Weber 22″ was set up for indirect cooking, but I put the plank over the center of the grill. Right across the aisle at Sam’s were some soft whole wheat ciabatta rolls, and further down the meat section I stumbled across thick cut maple bacon. 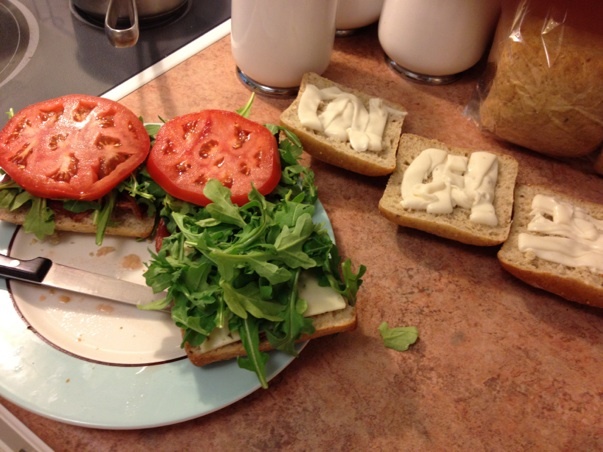 It was all assembled along with a huge heirloom tomato, a fistful of arugula, and some Miracle Whip. One of the sandwiches was tomato-less, with a sub of pepper jack cheese, for my picky wife. Special orders don’t upset us. 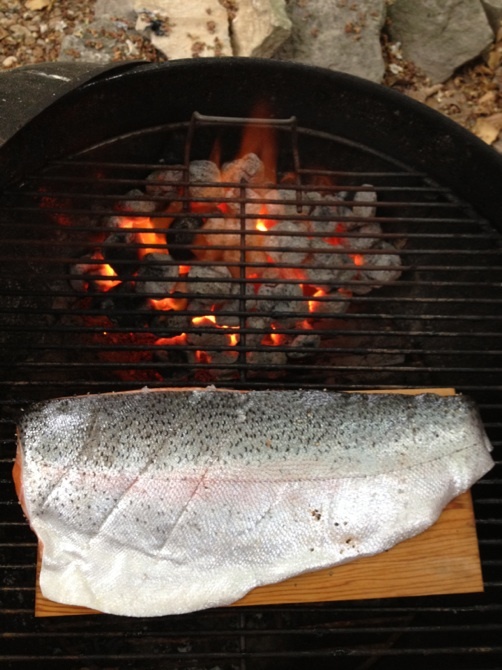 After 20 minutes or so, the trout skin was crisping right off of the filet. I peeled the whole thing off with minimal effort. It made some wonderful fish skin bacon for the dog. 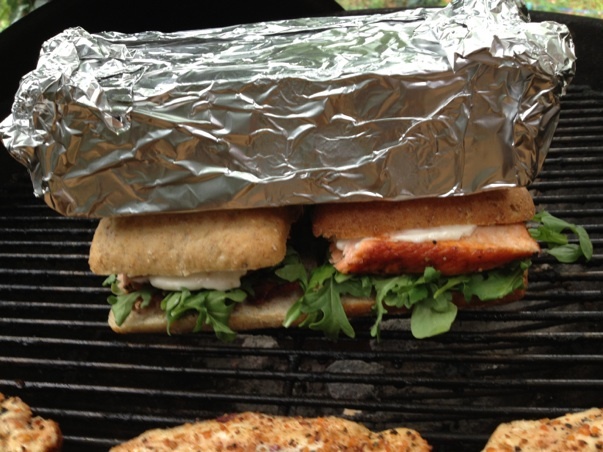 Another ten minutes on the grill and a few beers later, and I married the fish onto the sandwiches. Of the three rolls, the wifey one and a normal one went on the grill for some time under a panini brick, whilst the third was cut and served un-paninied for comparison’s sake. Though this may hurt my chances at an international patent on the invention, the panini brick is just a bunch of aluminum foil wrapped around a paver stone or red brick. Here you can see the red brick model, soon available for purchase through the future e-commerce section of this site. I would gladly pay money for the non-panini version of this sandwich. The fish was plentiful and moist, full of flavor. 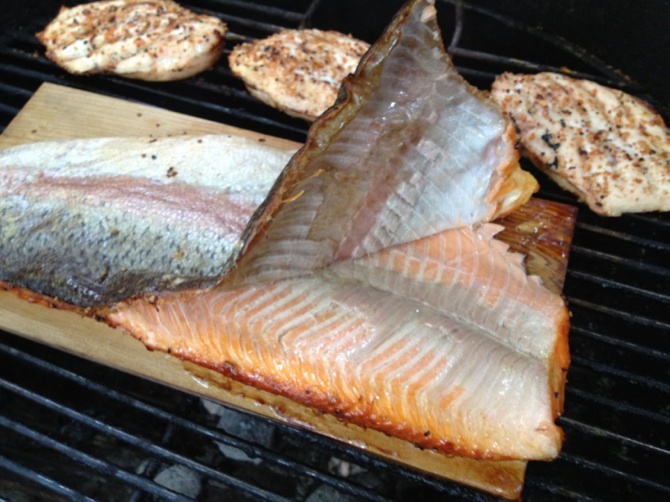 Steelhead trout has a salmon flavor, as the color indicates, but it is milder, with a flesh very willing to accept the smokiness of the cedar plank. The maple bacon was a good call, giving crispiness and some sweetness. For ciabatta bread, it was soft and complementary, as opposed to dominating. The panini version was consumed pre-photograph, so you will just have to take my word for it that it was also delicious. The bread was crispier and the flavors melded a little better. Some people won’t like warm Miracle Whip or having their cold sandwich veggies warmed up. Both versions were wonderful, and the entire process took an hour (not counting the bacon that I cooked and trimmed earlier in the day). For a BBQ competition, this is a time-effective, flavorful recipe that will almost certainly be a distinct selection over the other entrants in the BBQ entree category.